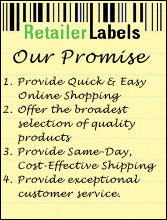 These are RetailerLabels.com (“RetailerLabels.com”, “we” or “our”) Standard Return Policies applicable only to products purchased by you directly from the RetailerLabels.com website. All product returns require a Return Merchandise Authorization (RMA) number. You may obtain an RMA number by contacting RetailerLabels.com Customer Service through any of the methods provided under the Contact Us page. This is our Standard Return Policy. Items covered by this policy (those products for which RetailerLabels.com states "This item may be returned for a replacement or refund within 30 days only") must be returned to us within 30 days of the invoice date for this policy to apply. “Return” constitutes receipt of the product by RetailerLabels.com, and not the mere issuance of an RMA.